Against the backdrop of the rise of Big Data and Artificial Intelligence (AI) technologies, the digital economy is now entering a new phase where “information is king” and data storage has become a key battleground. 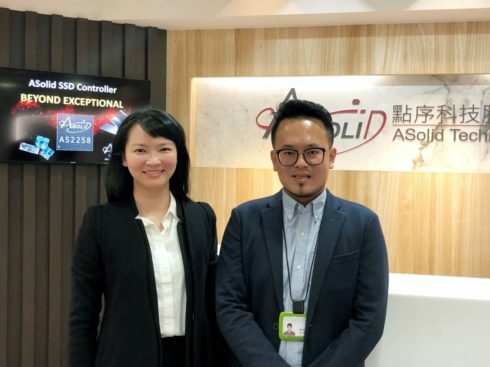 Established a decade ago, ASolid Technology Co., Ltd. focuses on developing cutting-edge NAND Flash controllers and has already consolidated its position as the world’s largest controller solution provider for SD memory cards. ASolid is now moving on to striving for the next milestone as the company prepares to expand and extend its product lines to include solutions for USB, eMMC, and SSD controllers. Going forward, ASolid will meet current and future needs of the market with its speed and technical capability. As the world’s largest controller solution provider for SD memory cards, ASolid is also one of the only three suppliers of controller ICs with a complete product lineup for NAND Flash applications, besides Phison Electronics and Silicon Motion Technology. These impressive results are made possible with ASolid’s portfolio of key technologies for NAND Flash controllers and two “secret weapons” that give the company an edge in the market. The first secret weapon is the company’s CEO Kevin (Kun-Wang) Liu, who co-chaired MMCA with memory module maker Kingston and served in the committee on the development of the JC64 standard under JEDEC. Liu has led his R&D team to proactively engage with these two major international organizations of semiconductor engineering and trades. In establishing technology standards, ASolid has also collaborated closely with chief NAND Flash vendors (e.g. Intel, Micron, Samsung, SanDisk, SK Hynix, and Toshiba) and leading mobile chip makers (e.g. Qualcomm, Broadcom, and MediaTek). Because of the tight partnerships with participants across the industry chain, ASolid is always able to obtain engineering samples and technical specifications from NAND Flash vendors for their next-generation NAND Flash products during their initial stage of the testing process. The second secret weapon is the company’s in-house R&D team. In addition to having more than 20 years of experience in designing NAND Flash controllers, this team is also the fastest within the industry in providing support for the latest technologies. ASolid can assist its clients in arranging the best schedule for product release as to seize the market initiative. The speed of delivering and receiving support is decisive to achieving success in the field of NAND Flash controllers. Falling behind in supporting the upcoming generations of products will lead to suppliers and vendors being squeezed out of the competition. Taking SSD products for example, ASolid is way ahead in providing support for the latest 3D-NAND Flash technology. When the first generation of L06B and B0KB products from Intel, Micron, and Spectek hit the market, ASolid was the first controller provider to have supporting solutions ready for mass production. Likewise, ASolid is among the earliest to begin design-in for the newest generation of other NAND Flash memories, including B16/B17 from Intel/Micron/Spectek, BiCS3 from SanDisk/Toshiba, and V4 from SK Hynix. At the same time, ASolid continues to maintain high levels of quality and production yield for all of these solutions. ▲Asolid’s R&D team has more than 20 years of experience in designing NAND Flash controllers. A supplier must have already built up a wealth of expertise before it can develop support for NAND Flash memories fabricated on the most advanced processes. In contrast to ASolid, other would-be market entrants simply do not have know-how to fully grasp the details of the NAND Flash technology. This is also why ASolid is able to see shipments of its SSD controllers take off within a year after its official launch in the first quarter of 2017. The market growth of ASolid’s SSD solutions has even surpassed those of veteran competitors that have developed their offerings for this application at a much earlier time. The market for SSD controllers has in effect become a fiercely competitive battleground in recent years with numerous suppliers. To stand out in this red ocean, ASolid opts to concentrate on laying a solid foundation in the R&D of NAND Flash controllers rather than trying to undercut its competitors. ASolid proactively meets the evolving challenges connected to the generational migrations of the fabrication process. Having accumulated years of technical experience, ASolid is able to break into the SSD controller market with products that directly support 3D NAND Flash. Furthermore, the company is also highly mature in its capability to develop related firmware, so its solutions are total packages and can take its clients to an impressive level of high-yield NAND Flash applications. In sum, ASolid can help its clients raise the overall production and generate highly profitable results. In ASolid’s SSD controller offerings, the AS2258 SSD SATA 6Gbps Controller features a “killer app” – the integration of SDRAM into the controller IC to increase the read/write speed. In terms of performances, the AS2258 not only approaches the limit of sequential read/write speed of the SATA-6G standard, it also achieves higher 4K random read/write speed, thus bringing much enhanced user experience. More importantly, clients who use the AS2258 can save on the cost of DRAM while maintaining the same high level of performances for their SATA-SSDs. The AS2258 SSD SATA 6Gbps Controller will be among the offerings that ASolid will be showcasing at COMPUTEX Taipei 2018. In terms of its support for 3D NAND Flash, the AS2258 can satisfy all the mainstream needs of the client market, bringing the desired effects from the design-in to the design-win. Because the AS2258 reaches the limits of SATA 6Gbps as well as raising 4K-IOPS to a higher level, it has the critical speed and reliability advantages that create incredible user experience. SSDs with the AS2258 controller will exceed the consumer expectation for this type of products that are on the market. Besides the efficiency advantages resulting from the integration of SDRAM, the AS2258 also offers extremely high C/P ratio due to having the lowest BOM cost in the industry and a simple PCBA design. It can give a major boost to the competitiveness of a storage product. Lastly, ASolid has numerous service locations in Taiwan and China’s Shenzhen to provide clients with full range of technical support. It is worth mentioning that the idea of “clients are kings” is built into the core of ASolid’s corporate culture, and the spirit of service towards clients is instilled in all levels of the company as well as in all of its products. An increasing number of clients in the SSD market have adopted controllers from ASolid since 2017. Within a short time, the company has received many positive reviews and feedbacks as clients expressed high levels of satisfaction with regard to the product quality and yield rate. The stellar reputation that ASolid has attained on the internet now attracts more and more SSD makers that want the best controllers for their devices being readied for mass production. ASolid expects shipments of their SSD controllers to go up significantly during 2018 in correlation to the expansion of the NAND Flash supply. Data security is now a global concern, and doubts have been raised on the strength of the protection that the partners in the storage market are capable of providing. With respect to security and privacy, ASolid guarantees that there is no backdoor for all of its products. Furthermore, ASolid has developed various FW protection measures along with advanced backup mechanisms to safeguard data. The company has been rigorous in this area and is confident that its SSD controller can play a major role in creating an impenetrable layer of protection for storage products. ASolid is very optimistic in its outlook of the NAND Flash market for 2018. The company points out that the SSD controller market is now benefiting from rising production yield rates of 3D NAND memories from major suppliers. Memory makers have also continued to expand their production capacity. This is a turnaround from the serious undersupply situation during 2017. The relief to the NAND Flash shortages at the start of 2018 was furthermore a positive development for controller solution providers. As NAND Flash supply increases throughout this year, shipments of SSD controllers will also grow. On the technology front, ASolid is doing R&D on PCIe solutions and expects to launch its first PCIe-SSD controller by the end of 2018. The strategy of directly entering into the mainstream high-speed market segment, which was formulated for the development of SATA-SSD controllers, will again be used in breaking into the PCIe-SSD market. Thus, ASolid will be immediately offering PCIe Gen3x4 solutions so that clients will have better options. In the mobile storage market, ASolid firmly supports UFS as the mainstream standard in the future. UFS currently still faces some challenges, such as its noticeable price difference with eMMC and its speed performance being constrained by the limits of the 4G network. While just a few flagship smartphones have adopted UFS for now, ASolid believes the market share of this interface standard will grow with the gradual expansion of the 5G network around the world. The company is also engaging in the R&D of UFS controllers and expects to launch related products in 2019. This schedule will be adjusted in accordance with the actual progress of the UFS uptake. With 10 years of specialized experience in the NAND Flash market, ASolid is proud to present its full range of controller products for SSD, eMMC, SD, and USB. As the NAND Flash market continues to grow, ASolid will maintain its focus on the core business of memory controllers. At the same time, the company will also explore opportunities in other segments in addition to consumer products. Areas that ASolid are planning to enter include enterprise storage, industrial control, and automotive electronics. There will be no complacency when it comes to meeting the needs of different types of clients. ASolid will be participating in COMPUTEX Taipei 2018 between 5 June and 8 June. The company’s exhibition, which is located in Room 1147 of Grand Hyatt Hotel Taipei, will showcase its full-coverage portfolio of NAND Flash controller products for prospective clients and interested parties that want to find out more about these solutions. Developers of NAND Flash storage products should not miss out on this opportunity to acquire key technologies that can lead to their market success!